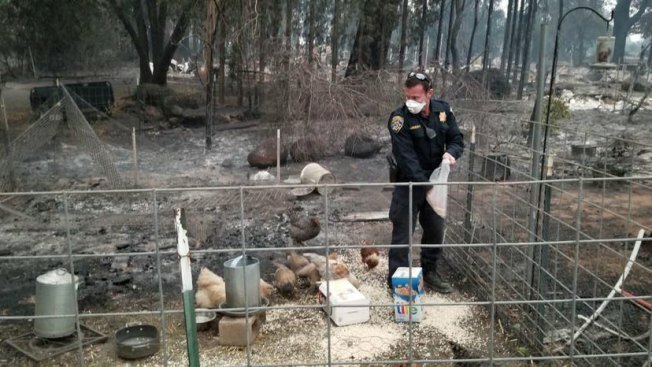 A California Highway Patrol officer patrolling for looters in the aftermath of the wildfire in Butte County became a looter himself on Monday, but it was done to save starving chickens. "While on patrol in the Paradise area looking for looters, I heard the faint sound of a chicken. After a short hike, I located about a dozen chickens that literally ran to me," the CHP Oroville officer told his story on Facebook. The unnamed officer gave the ash-covered fowls — who managed to survive the so-called Camp Fire that already killed at least 48 people — his water but he didn't have any food with him. The officer said he searched for food and found a bag of oatmeal and two bags of cereals in a nearby garage. "These chickens were sooooo happy to be fed and watered. Whoever owns these chickens, I owe you a few bags of cereal, sorry," he wrote. At least six people have been arrested for looting near the town of Paradise. Some of the suspects are facing weapons, drugs and possibly stolen property charges, according to Butte County Sheriff's Office. The CHP officer's Facebook post was shared over 16,000 times after it was posted on Monday. The owners of the chickens recognized their house from the post and contacted CHP Oroville to thank the officer for feeding their pets. "I met them and they provided me supplies, so I went back to feed and water my new friends and discovered they had left me a few gifts," the officer wrote in another post Tuesday. Freshly laid eggs from the appreciative hens. The Butte County Agriculture Department and the Sheriff's Office on Wednesday have allowed livestock owners access through traffic control points to restricted and evacuated areas. Livestock owners must obtain a letter at 316 Nelson Ave. in Oroville. The Agriculture Department will be opened from Monday to - Friday at 7:30 a.m. to 4:30 p.m. and Saturday at 8 a.m. to 2 p.m. Residents can call 530-538-7381 for more information.